Among Arab leaders, King Abdullah II of Jordan is the latest to join Twitter, and was welcomed by Queen Raina, who also became his first follower. His Highness Sheikh Mohammed bin Rashid Al Maktoum, Vice-President and Prime Minister of the UAE, and Ruler of Dubai, also welcomed him to the world of Twitter. 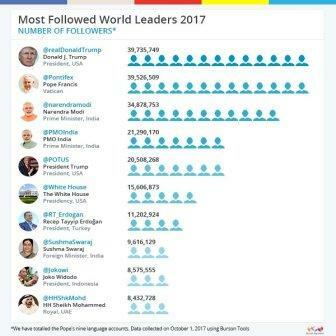 According to Twiplomacy, Sheikh Mohammed is one of the most followed leaders around the world in 2017. It is also worth noting that he is the only Arab leader in the top 10 list. The Dubai Ruler is joined by the US President Donald Trump, Indian Prime Minister Narendra Modi, Turkish President Recep Tayyip Erdogan and Indonesian President Joko Widodo.